Our volunteers are the life-blood of our organization. 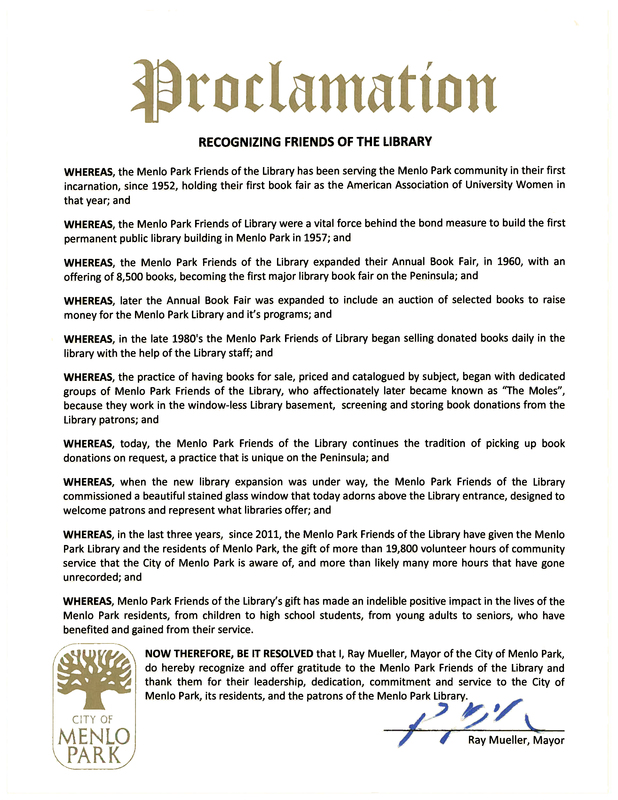 By Proclamation, the City of Menlo Park has recognized the indelible positive impact of our substantial volunteer hours for Menlo Park residents. perform all required administrative tasks. Throughout our history we have been able to fulfill our mission thanks to the commitment of our volunteers. Our team of regular volunteers participates in our day-to-day operations. A smaller group supplements our regular team with assistance in our on-site book sales. We often have opportunities for additional volunteers. So please consider us if you are looking for a rewarding and fun volunteering opportunity. Thank you! Please see How to Apply. Our volunteers work at the Main Library at 800 Alma Street, Menlo Park. See Directions. We offer our volunteers the opportunity to work with donated items in a congenial environment and play an important role in moving the items through our system to raise money for the Library. We offer orientation and training to enable new volunteers to function without supervision. However, follow-up assistance and advice is always available. So long as volunteers can meet our expectations as to their minimum time commitment (please see "What We Ask From Our Volunteers" below), hours are generally flexible. Once volunteers have been trained, they can come into the Main Library whenever it is open. For the Library's operating hours and holiday closures, see Library Hours | City of Menlo Park - Official Website. We ask for a minimum commitment of 2-3 hours a week for those who want to volunteer with us on a regular basis. We also ask them for a minimum commitment of one year, although we prefer those who can give us a longer period. 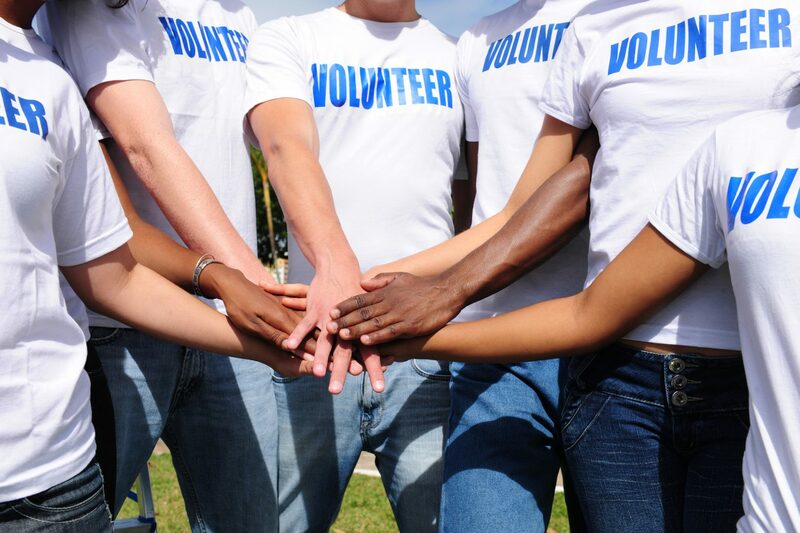 Our volunteer opportunities are not suited to shorter-time or one-time volunteering. We expect all our regular volunteers to be trained in inspection, sorting and pricing of donated items. Some regular volunteers may be selected to focus primarily on Amazon listing and order fulfillment but we ask them to do sorting and pricing when necessary. Some volunteers undertake tasks (such as bookstore re-stocking, and Amazon listing and order fulfillment) that call for a regular weekly schedule. Our other regular volunteers can contribute their hours in a single session or distributed across two or more sessions to suit their own schedules. However, we have found sessions of under an hour to be less productive. To manage our workflow, we prefer that our regular volunteers stick to pre-established days and times whenever possible. However, we understand that occasionally they will need to adjust their schedules. Tasks available to those volunteers interested only in helping with our book sales include pre-sale set-up, cashier and post-sale take-down. However, our primary goal is to attract regular volunteers, many of whom also help with our book sales. All our volunteers are required to adhere to all relevant policies of the Library, as well as our own operating guidelines. Volunteers are expected to sign the City of Menlo Park's volunteer agreement. Volunteers must be over the age of 18 and must be willing to work on-site at the Main Library at 800 Alma Street, Menlo Park (see Directions). Ability to work from a computer is essential since that is how we price most of our donated items. For those interested in helping with Amazon listing or order fulfillment, a higher level of computer literacy is required. Prior experience in sorting or pricing books, while helpful, is not required. We provide the required training for anyone interested in working with books. We work in a basement area of the Main Library that is well-lit but has no windows. Elevator access to that area is available. We work in a library-type environment where everyone is able to function quietly and efficiently. We strive to accommodate individual situations but our work necessarily entails lifting, moving around and shelving books. Those volunteers who are able to move donated items down to the basement and up to our bookstore are asked to do so. However, that ability is not a requirement. call us or leave a voicemail.